A cornerstone in the vampire movie genre. I had this movie on VHS and must have watched it more than 10 times. Recently my current streaming service suggested it and I had a happy reunion with it. Even though it has a few discrepancies with my opinion of vampire lore, it is still a very good vampire movie (and it was made way before glittery sparkly vampires were popular). The plot is very simple with no twists at all and you know exactly how it is going to end, I still think it is a good action movie. 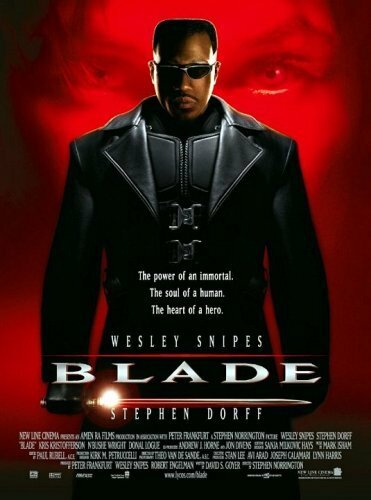 Wesley Snipes is perfect as Blade. He is solem, slightly angry, does not have too many long lines and very action packed. The challenge is clearly the martial and acrobatic prowess and not acting skills, which suits him perfect. Kris Kristofferson is good as whistler. The same goes for Stephen Dorff as Frost and Udo Kier as Dragonetti. When the movie came out in 1998 I remember being impressed with the effects when the vampires evaporated after some loving care from Blade, and I still think it looks rather cool. I also remember being appalled at how poor the animation of the flowing blood during the ritual was. They should have done that part differently. In general the soundtrack is quite suiting for the movie. I remember how popular the son Confusion from New Order became due to movie and also how people went amok on the dance floor when they played it in clubs. Today I still get a small kick from hearing it. If you like vampire movies or hard hitting fantasy action movies, this is absolutely one to watch.